What is E.H.F. - Environmental Handling Fee? What is the Excise Tax for? An excise tax of $100 is payable for vehicles with air conditioning that are purchased in Canada or imported from the United States. This tax is payable to CBSA at the border when the vehicle is permanently imported into Canada. was put into service after March 19, 2007. MSRP stands for Manufacturer's Suggested Retail Price. MSRP is an acronym that stands for manufacturer's suggested retail price. Manufacturers (i.e. Audi) use MSRP as a base price to give retailers their estimated value of a product. This is not the usually the actual price of an item, but rather what the manufacturer suggests as the maximum price that the item could be expected to sell for. Dealers, are free to offer the vehicle for a lesser price, but never more on a new retail vehicle. MSRP generally does not include additional trim levels, options, accessories, Freight, PDI, administration fees, or taxes. The definition of MSRP is "Manufacturer's Suggested Retail Price"
An Ontario Ministry of Transportation (MTO) Safety Standards Certificate (SSC) is a document that certifies a vehicle's fitness. You can buy and register a vehicle without a safety certificate, but you cannot put your own plates on the vehicle or drive it without one. Any inspection station in Ontario licensed by the Ministry of Transportation can issue a Safety Standards Certificate, provided your vehicle passes an inspection. A Safety Standards Certificate is valid for 36 days after the inspection. However, the certificate is not a guarantee or warranty that the vehicle will stay fit for any period. What is a Safety Standard Certificate (SSC)? An SSC is a certificate that is issued by a government- approved Motor Vehicle Inspection Station (MVIS) after a vehicle passes an inspection. This inspection covers the minimum safety requirements for vehicles in the province of Ontario. When do I require an SSC? Is an SSC a warranty on my vehicle purchase? An SSC is not a warranty or guarantee on the general condition of the vehicle. The SSC only certifies that on the date it was issued, the vehicle met the minimum safety standards as set down by Regulation 611 of Ontario's Highway Traffic Act (HTA). How long is an SSC valid for? For the purposes of transferring ownership, an SSC is valid for 36 days from the day that the SSC was issued. For full details, please visit this website. If you are approaching the end of your lease and have questions about what comes next, please contact our Financial Services Managers at 905-844-2834. What are the current specials on your Audi vehicles? At Audi Oakville our Manufacturer Incentives, and in-house promotions are always changing. To view current special offers for New and Used Audi Vehicles, Service, and Parts please visit this link. You may also visit or contact us for more details. How can I get the vehicle history before I purchase a used Audi? The history of a vehicle is very important to a prospective buyer, and at Audi Centre Oakville we are happy to provide a CarProof Vehicle History Report on any pre-owned vehicle we have in our inventory. You can obtain a vehicle history report by contacting the Used Vehicle Department. Additionally you can learn more about CarProof Vehicle History Reports here. How New Vehicle Pricing works? If you're reading this, you are likely in the market for a new car and doing a lot of research. Depending on where you are looking, you may have noticed multiple prices for the same vehicle. For instance, TV commercials may advertise a 2017 Audi A4 differently than the pricing you may see on a website. This may lead to some confusion but the reason is pretty simple In Ontario, all dealers must advertise their pricing according to OMVIC (Ontario Motor Vehicle Industry Council) regulations. One of those laws is, we must advertise the "All-In Price", which is MSRP (Manufacturers Suggested Retailing Price) plus all applicable fees and levies. Not all advertising always complies with this law and sometimes you will just see MSRP Advertised. 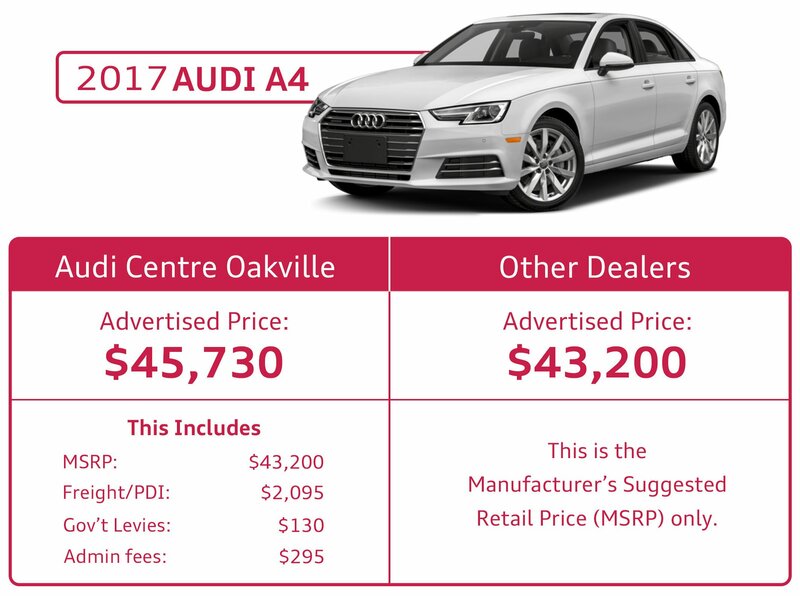 All dealers will charge the "All-In Price", but you might not know that until your sitting at the negotiation table At Audi Centre Oakville, it has always been our policy be upfront, honest and clear about our pricing. See the chart below for a complete breakdown of pricing. Basically, the price you see advertised on our website is the REAL PRICE you will actually pay less taxes and licensing. At Audi Centre Oakville, we believe in transparency and providing our customers with the information they need so they can make a better, more informed decision. If you have any questions about OMVIC, MSRP or All in Pricing, let us know via the form below! Audi Canada configures its model line-up independently from other markets, based on the needs of Canadians and Canadian legal regulations. Can I purchase my Audi vehicle directly from the manufacturer? All of the retail sales of vehicles in Canada are done directly through the many Canadian Audi dealers. Audi Canada is the importer and is responsible for the warranties offered on Audi vehicles. If you are interested in a new Audi Vehicle, please visit our virtual showroom. Where can I review the safety ratings for my Audi? Audi Oakville knows your vehicle best. There are many criteria to consider when choosing a tire, such as size, load index, traction rating and speed rating to name just a few. Contact a Service Advisor here for details and questions. Does Audi sell any factory-approved performance parts? Audi Centre Oakville sells specific performance parts for various models. These components include performance exhaust, sport-tuned coil springs, accessory alloy wheels, body kits, spoilers, etc. Please contact one of our Parts Advisors here for more details and installation rates. You can find extensive airbag information in your Audi's Owner's Manual. For further information on the workings of airbags, you can visit: How Stuff Works. For more detailed information on airbag safety, please visit: //www.safercar.gov/. Is there any warranty on tires with a new Audi? The warranty for tires on your new Audi vehicle is honoured by the tire manufacturer. For more information, please ask a Service Advisor. "Afford" a nicer car. If you've ever wondered how it is that so many people can afford to drive an Q7 or A7, then wonder no more. According to LeaseGuide.com, around 75% of all luxury cars are leased. The reason is because banks don't like to loan out more than $30,000 for a car loan. If you want a car that's worth more than that and you don't have the money to make up the difference, leasing is your only option. On the upside, your monthly payment will be lower than if you actually bought a car. Leasing allows you to "afford" a nicer car than you'd get if you had to buy it. Can I install bigger alloy wheels on my Audi as approved by Audi Canada? You may increase the wheel diameter on many models as long as you keep in mind certain specifications, such as outer tire diameter, ground clearance wheel offset Visit, or Contact a Service Advisor us and we can help you select the factory-approved wheel and tire package that is best suited for your Audi. No. Any damage or defects caused by the use of non-genuine Audi parts are not covered by Audi Warranties. Only Audi parts and accessories are covered by the Audi parts warranty. What is the warranty on Audi accessories? When installed on a new Audi vehicle prior to delivery, the warranty on accessories increases to 4 years/80,000 km, whichever occurs first. If purchased over the counter or after taking delivery, all genuine Audi accessories carry a spare parts warranty of 1 year/20,000 km, whichever occurs first. For more information, please ask a Parts Advisor. What is the warranty on Audi parts? What if I install them myself? Audi parts installed at the dealership carry 1 year or 20,000 km spare parts warranty, whichever comes first. Genuine Audi mufflers, shocks, struts and strut inserts have a limited lifetime warranty. Audi parts sold over the counter come with a reduced coverage limited to the part itself, not including labour. For more information, please ask a Parts Advisor. Please contact Audi Oakville and arrange for an appointment as soon as possible so this service can be performed free of charge. Please keep in mind that your dealer may need additional time for preparing the update as well as adjusting their daily workshop schedule. Top tier gasoline is the premier standard for gasoline. Gasoline quality impacts on engine behaviour, efficiency, performance and service life. For this reason you should always use good-quality gasoline containing the proper additives. These additives will help to prevent corrosion, keep the fuel system clean, and prevent deposits from building up in the engine. More information can be found using this link: www.toptiergas.com. Lock cylinders can freeze up in the winter. To de-ice the door lock cylinder, we recommend using a special spray to replenish lubricating oils and protect against corrosion. Ask your authorized dealer for assistance. The rubber seals on the doors, windows, etc., will stay soft and flexible, and will seal better and last longer if they are treated with a suitable rubber-care product. Caring for rubber seals will also help prevent premature aging and leaks. The doors will be easier to open. If rubber seals are well maintained, they will not freeze as easily in winter. Regular and expert care helps a vehicle keep its value. The best way to protect a vehicle against environmental damage is to wash it often. For more information, you can refer to your Owner's Manual. The Parts Department at Audi Oakville is more than happy to assist. You can order a new Vehicle Owner's Manual by contacting our Parts Department. This limited corrosion warranty covers any repairs or replacement of body sheet metal panels that have been perforated by rust. For more information, please see the warranty section of your Owner's Manual. My engine malfunction light is on. Can I keep driving my vehicle, or should I have my vehicle towed? If the yellow check engine light stays on (not flashing) you may continue to drive the vehicle. Please schedule a visit here with Audi Oakville as soon as possible. If the yellow check engine light is flashing, please pull off to the side of the road safely, and arrange to have the vehicle towed to the dealership. Why should I go to my Audi dealer for an accident repair? Your authorized Audi dealer is the best choice for all of your Audi needs. In the case of an accident repair, your Audi dealer will have access to genuine Audi parts for your vehicle. Furthermore, they have the technical knowledge and expertise to repair your vehicle should any further damage to your Audi be noticed. Will maintaining my vehicle at a Audi dealer increase my resale value? Properly maintaining your vehicle from day one according to the manufacturer's guidelines and schedule is the surest way to maintain a top resale value. Since automobile technology changes continuously, your Audi dealer has the most current service and maintenance information for your Audi model. Furthermore, knowing that the records of your maintenance are kept under one roof and that genuine parts were used on your Audi will provide you and potential buyers with peace of mind. Where can I purchase Audi parts? Your Audi has been designed, engineered and manufactured to exacting standards. So it only makes sense to treat it to parts, accessories, service and protection that match our factory-best. Audi parts and accessories are sold through authorized Audi dealers. To find out more information, see our Request a Part page. Are prices on Audi parts competitive? In many cases, our prices are comparable and provide great quality and value. Audi Canada provides parts to its authorized dealers and includes a Manufacturer's Suggested Retail Price (MSRP). Audi dealers are free to adjust their retail price. We continually revise and compare our MSRP to be competitive. Does Audi provide a loaner vehicle while my vehicle is in for repairs? Loaner coverage is part of the New Vehicle Limited Warranty period valid for 4 years or 80,000km, whichever occurs first. This coverage includes rental provision for warranty-related car-down situations, which cannot be repaired the same day. For more information, please ask a Service Advisor. We suggest that you follow your dealer's recommendations. The maintenance interval in your Owner's Manual is based on operating a vehicle under normal conditions. Your dealer may make a different recommendation based on the condition of the belt upon inspection. The service intervals schedule in your Owner's Manual is based on vehicles operating under normal conditions. In the case of severe conditions, such as extremely low temperatures and/or excessive dust, it is necessary for some services to be performed between shorter scheduled intervals. This applies particularly to engine oil changes and the cleaning or replacing of the air cleaner filter element. In the event that it is impossible or unreasonable in an emergency to drive or tow the vehicle to the nearest authorized Audi dealer, Audi will review reimbursement to the purchaser the reasonable cost of warranty repairs performed by service facilities other than an authorized Audi dealer. If an emergency repair was performed by a non-Audi service facility, it is important to keep all original receipts, repair orders, and parts removed from your Audi. A statement describing the circumstances which prevented the owner from bringing the vehicle to an authorized Audi dealer is also required. These requirements must be submitted to your preferred dealer in support of a request for possible reimbursement. If your registered Audi vehicle is disabled because of a mechanical breakdown over 160 kilometers from your residence, and the repair is covered under your New Vehicle Limited Warranty, you may be reimbursed for trip interruption expenses if your vehicle cannot be made safely operable the same day. For more information, please see the 24-hour Roadside Assistance brochure supplied with your Owner's Manual or contact Roadside Assistance at 1-800-411-9988. The replacement of the timing belt of your vehicle depends on many factors. You can find the recommended timing belt replacement intervals in your Owner's Manual or by inquiring at our service department here. You can easily see the current hours of operation at our Location & Hours page here. Where can I purchase Audi clothing or merchandise? You may purchase Audi clothing and merchandise at our parts department. You can contact one of our Parts Advisors directly for questions here. Yes we do! Audi Centre Oakville has a wide variety of tires to suit your Audi vehicle. For more information speak with your Service Advisor or book a Serivce Appointment. I recently moved and would like to know how to update my address with Audi Canada? If you change your address, please complete one of the Notice of Address Change postcards in the middle of the Warranty section and mail it to Audi Canada. Additional postcards can be obtained from any authorized Audi dealer. You can also contact our Customer CARE Department at 800-822-8987. They will be happy to assist you with your change of address.